My 7 month old female chow seems to be fearful of my daughter. She keeps her distance and does this low growl at her. The pup wasn't socialized well for the 1st 6 months, before we picked her up. What are some options for training, so that she doesn't act this way? We don't want her to act like this towards our family that visits. Re: 7 month old chow growling at daughter. I have an 8 month old make chow right now and his favorite things are walks, treats and his tennis ball. I would suggest taking walks with your daughter and not only will that relation improve but might help with strangers too. If she like treats bring some along and they may help. I walk my chows before and after work and they look forward to them. I believe a routine or structure is a must but be patience because things won't change over night. 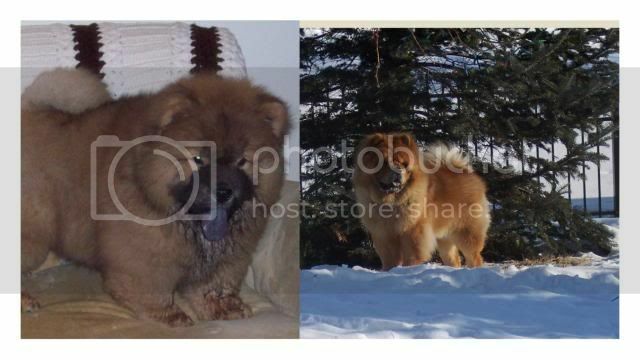 How old is your daughter and would love to see a picture of your chow girl. Be sure to update us on any progress. How old is your daughter? I had a chow one time who appeared scared of toddlers/children at his eye level. I'm sure you know this but please NEVER leave them alone for even a second! You will need to work on general socialization with your pup. Walks, going to parks, Petsmart, anywhere that you can take her to be safe and explore her world. You might consider a group puppy class that uses only positive training techniques. As far as your daughter if she is old enough take her on the walks with you, have her involved with food preparation, feeding, and giving treats if it is safe. Let your new pup learn that all good things in her life come from your daughter. Explain to your daughter that it is going to take time and work to build trust with her new scared pup. Again most of this depends on the age of your daughter. If your daughter is grown and only visiting then you can certainly try some of the above methods but it is a different situation. Our daughter is 12 and its been 2 weeks now. Our pup, Roxy, has really warmed up to her. We basically just had her ignore Roxy and everything good came from our daughter. She also walked with us first and then she walked her. We went almost everywhere with the pups. We were at Home Depot and Roxy stayed next to our daughter as her safe spot. I've had Labs most my life and have learned that Chows are slower to accept someone into their circle. The girls as puppy's and now. Our cream is 11 and red is 7 months.